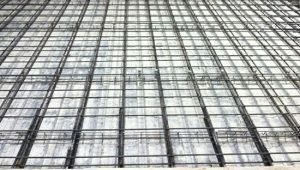 Choose Donald Rushing Construction for Your Next Structural Concrete Project. 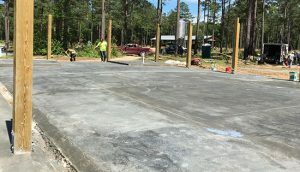 Donald Rushing Construction specializes in tackling complex concrete construction projects in Savannah, Southeast Georgia and the Carolina Lowcountry. From pumping stations, to large building foundations, to long heavy-duty roadways, you can count on Donald Rushing Construction to build the best concrete structure possible—on time and on budget. Our customers include FedEx, Dulany Industries, St. Joseph/Candler Hospital, Colonial Oil, Hormel Foods and Conway Freight, among others. Donald Rushing Construction is the Coastal Empire’s One Stop Shop for Concrete Construction. Many of our customers use us for the entire concrete construction process— from design to site preparation, to form construction, rebar installation, concrete sourcing pouring, and backfilling, to finished grade and clean up. 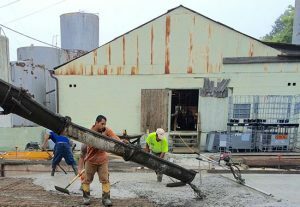 We are the most comprehensive structural concrete choice for local business and industry in the Coastal Empire. Most construction schedules are difficult and require skilled coordination between sub-contractors. Resource allocation has become more difficult for all subs as business and industry continue to adjust to new economic pressure. Donald Rushing Construction’s start-to-finish concrete capabilities eliminate the headaches and costs associated with managing multiple sub-contractor schedules. When we are engaged to design and build the structure, we typically deliver a finished project at a lower cost than when multiple subs are employed, because we are in a better position to closely manage and control all of the activities, and ensure a continuous and efficient construction process. Construction projects can be interrupted and money can be lost as subcontractors juggle their crews between different projects. A day’s delay by one can delay another by that much or more. With Donald Rushing Construction working as your coordinated one-stop team, you’ll avoid delays and keep your project on time and on budget. To experience the Donald Rushing difference, contact us today. Phone: 912 964-0080 | email: sales@donaldrushing.com. A List of Donald Rushing Construction’s Concrete Capabilities Appears Below. To learn more, call 912 964-0080 or email: sales@donaldrushing.com.